To explain what it is that Woodland Heritage do, their simple founding principle is perhaps the best place to start: the importance of uniting the people who use wood with the people who grow trees; so, what better cause to bring to the attention of our woodworking readers? In 1993, Peter Goodwin and Lewis Scott were speaking of their concern for the UK's relatively low tree cover - around 10% compared with a European average of 27% - when they decided to make a change. Their plan was to set up an accessible way for wood users to put something back - for the processes of wood use and wood renewal to be appropriately linked. 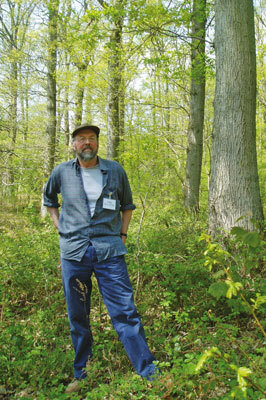 They proposed the idea to 20 fellow furniture makers, all of whom joined the cause, and thus Woodland Heritage was born. Woodland Heritage is not only for woodworkers - they involve 'wood users' of all professions including wood buyers and vendors, sawmillers, loggers and even the consumers. Their members, which now number several hundred, range from corporate participants in manufacturing, retail and associated trades, to landowners, estates, and other private members, with the patronage of HRH Prince Charles. 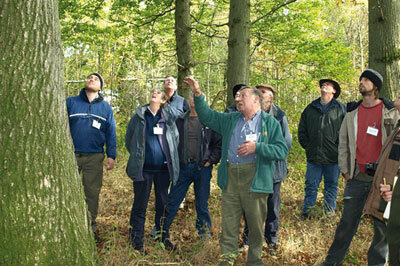 They also run 'Woodland to Workshop' courses, which bring together wood users and wood growers over three days in the woodland, sawmill, timber yard and joinery workshop, so a diverse range of students involved in some way with wood can learn from one another as well as the course leaders. 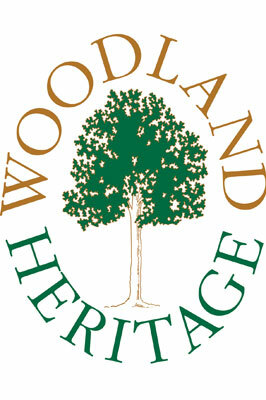 WH is a registered charity which as well as educating, supplies funding to research and conservation projects in our woodlands. They publish a yearly journal full of topical research, education and articles on silviculture - the practice of controlling the establishment, growth, composition, health, and quality of forests to meet diverse needs and values - as well as celebrating what is finally done with wood by skilled craftspeople. Here we have collected and condensed some varied pieces from the 2013 edition to give you some idea of the breadth of concerns and activities this fantastic organisation is involved in. Our forests are certainly under attack. In addition to the recent devastation caused by ash dieback - the Chalara fraxinea fungus - Acute Oak Decline hit the national headlines a few years ago, closely followed by chestnut blight and the oak processionary moth. Other threats on the horizon include, among others, the Asian longhorn beetle, which we brought to your attention in WPP 68. The Woodland Heritage is instrumental in raising the necessary funds for numerous projects to protect our trees from these threats. In 2012, WH raised over Â£200,000 from their members, with support from three charities, to fund Forest Research's vital study into Acute Oak Decline. The money meant that Dr Sandra Denman could equip the study with the necessary involvement of a molecular microbiologist, an internationally recognised bacterial taxonomist and a laboratory assistant. 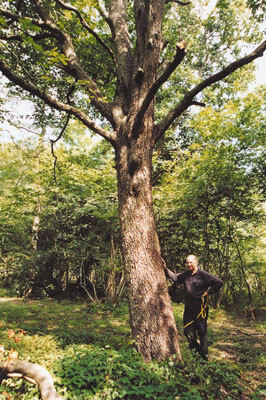 It is vital to attain a proper understanding of the causes and prevention of Acute Oak Decline while the problem is on a small scale - we need the knowledge and means to restrict the damage should the situation change, to prevent large-scale losses of oak (Quercus robur), our iconic and immeasurably important native tree, from occurring. 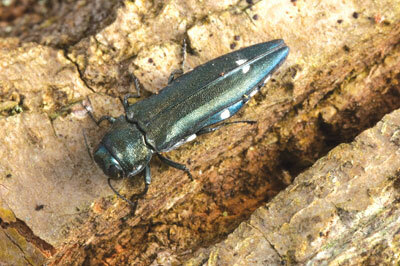 The research is centred on the bacteria and microbiology in the damaged tissue of AOD trees, discovering what attracts the agrilus beetle - which is often found in co-occurrence with the AOD - to the oak trees, whether volatiles from the bacteria attract the beetle, and raising beetles in captivity to ascertain the effects of different temperatures and compounds. Modelling work will estimate the boundaries of the distribution of AOD and model the risk of spread. Much of this work is being carried out by PhD student Nathan Brown, who has been working on AOD for the past four years, and has an intimate knowledge of the condition. WH have managed so far to raise half of the Â£90,000 needed to renew Nathan's PhD contract for another three years, so securing his essential services for 18 months, but Â£45,000 is still needed to fund his research for the necessary period. Dr Denman is finding evidence of more and more English oak trees suffering from poor root health caused by Armillaria - honey fungus - which she considers to be a key dimension in her quest to find the cause of AOD. 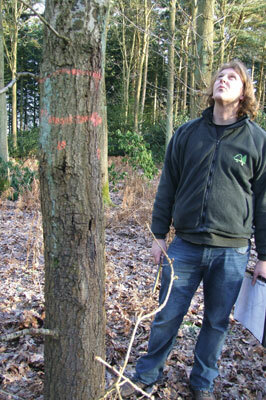 Nathan Brown's work will also include working on root health under Dr Denman's guidance. It is sadly now widely accepted that the majority of our ash (Fraxinus excelsior) will be lost from our forests in the next few years due to widespread ash dieback. Many foresters are now considering their options for planting alternative species in their place in the absence of confirmed resistant ash, and in their journal the WH propose the wild service (Sorbus torminalis) tree - see above - as a replacement in mixed woodland. In mainland Europe and North Africa, the wild service grows in association with whitebeam (Sorbus aria (L.) crantz). 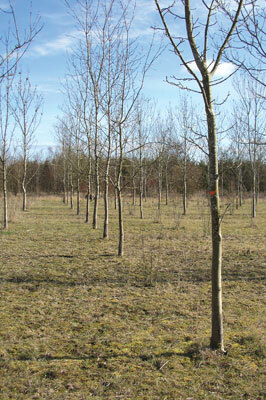 Whitebeam can be taken as a possible indicator of suitable wild service sites, even when the latter is absent. 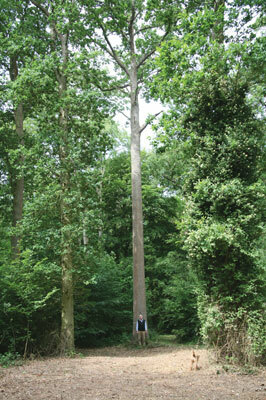 British trees have recently been recorded at up to 26m tall. The timber is a rich creamy colour with striations of pink and green, and it is hard and very smooth when worked. The Swiss regard the species very highly, giving it an almost mystical status - hence the alternative name 'Swiss Pear'. Consequently, fine specimens can be worth as much as, and sometimes more than, walnut (Juglans regia). Ash dieback echoes the Dutch elm outbreak, which led to the felling of 30 million mature elms in the 1960s and 70s, raising the question: can some semblance of the species be saved like that achieved for English elm (Ulmus procera) and other elm species in Brighton and Hove? This will largely depend on central government and whether politicians are prepared to invest in a long-term, scientific research programme, covering the identification, selection and breeding of ash trees that are genetically and sustainably resistant to Chalara fraxinea. "The omens are not good," says Dr Terry Mabbett, "DEFRA has shown no real interest in financing urgently required research into acute oak decline to unravel quickly the cause of this fast-moving, complex and serious problem threatening the very future of Britain's top hardwood timber tree. Raising and furnishing the extra funding required had so far been left to charities like Woodland Heritage," he finishes. 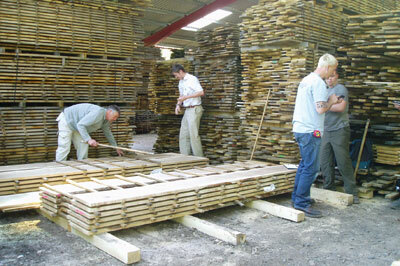 Woodland Heritage held their first three-day Woodland to Workshop course in 2008 at Whitney Sawmill near Hay-on-Wye, and run similar courses throughout the year, with attendees ranging from furniture makers, sawmillers, timber buyers, horse loggers and tree growers - the value of interactions between this diverse student group connected by wood gives the course a real sense of added value. 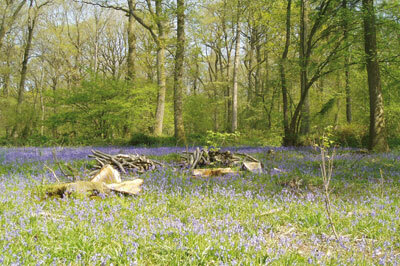 The woodland part of the course is led by Geraint Richards - Head Forester of Duchy of Cornwall and Graham Taylor - Forestry Consultant - in the woodland adjoining the sawmill. 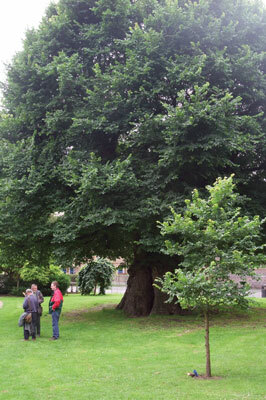 The tutors cover a range of topics and demonstrations, which include tree species selection, planting designs in relation to tree competition and the landscape, protection from grey squirrels and deer, recognising potentially valuable stems of oak, and the importance of the British and Irish Hardwoods Improvement Programme's work, to whom WH have donated since 1994. 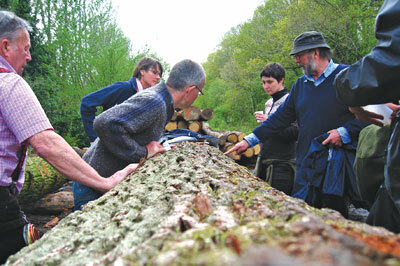 The workshop discussions and demonstrations take place at the sawmill, where the group learns about distinguishing between normal drying splits and shakes, minimising damage caused by ambrosia beetles, identifying various kinds of damage and undesirable features of logs such as woodpecker damage and blue stain, likely markets for unusual logs such as 'pippy' oak and ripple-grained sycamore (Acer pseudoplatanus), the merits of a portable bandsaw, measuring and calculating timber volumes both in the forest and the sawmill, and air drying. The courses have received high praise from the students, such as Eoin, who has been working with wood for 35 years said of the course, "for an old cynic like me to learn something new every hour was extraordinary," while Sharon, working in forestry and woodland management wrote "A mix of students is vital as everyone learns from each other. Hands-on, brilliant!" Among WH's members is the renowned British furniture designer, John Makepeace OBE. Some of his latest creations include this dining table in English mulberry and bronze, designed by Makepeace and made by Clive Baines for a private vaulted dining room. The design was devised to use a particular series of saw-cut veneers so that each 'panel' follows the grain to make the best use of irregular shapes of the timber. Once these were laid, the recesses for the water-jet cut bronze inlay were made by CNC router. 'Wings', a 2.4m high cabinet is made from a single tree of English ripple sycamore. Elliptical and tapering in plan, this cabinet was designed for storing bottles and glasses, and for serving drinks. The back, comprising one-third of the perimeter, the top, bottom and shelves are all fabricated, lipped and veneered with saw-cut veneers. The doors are solid, and carved both inside and out with the 'drapery' pattern that provides the handles. The serving shelf contains a tray for carrying glasses. The cabinet was designed before finally selecting the tree. Although the timber was originally going to be cut from 70mm quartersawn boards, on more precise assessment, John decided to saw at 60mm. 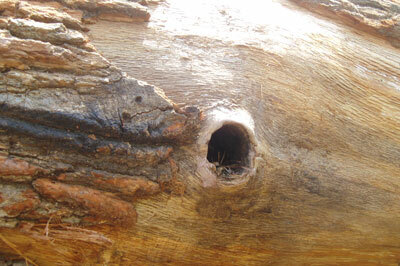 A veneer-quality tree, thankfully it had no defects. The wide boards would be used for the less curved parts of the ellipse, and the narrower ones for the sharper curvature to each side. A week or so after sawing and end racking, it went into the kiln and was delivered to the workshop three weeks later, pale and beautiful. Research is expensive, and further mapping and research is necessary to try to isolate the causes and find a way to understand and tackle this potentially devastating disease.